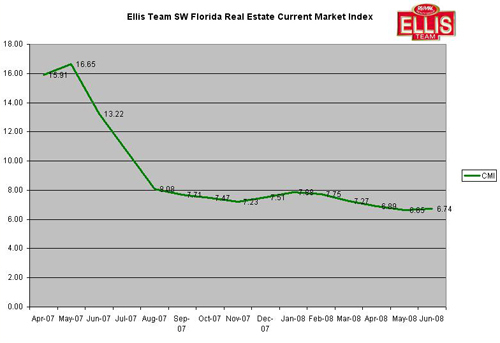 The January 2009 Ellis Team SW Florida real estate current market index covering Fort Myers real estate, Cape Coral real estate, and Estero leveled off this past month and currently stands at 6.74, up slightly from 6.65 the previous month. The index still shows signs of strong buying activity and overall market absorbtion. Single family inventory for Lee County dropped below 14,000 this month to 13,740, while pendings remained relatively the same. The Current Market Index for the entore county actually fell from 7.99 to 7.89, but we are reporting numbers in the graph for just Fort Myers and Cape Coral real estate single family homes. Single family home inventory has been falling nicely as the market has been absorbing homes to the market all throughout 2008. Other agents are just now starting to pick up on this trend and report it, instead of the gloom and doom some have been reporting all year. Next month we’ll be releasing our annual SW Florida State of the Market Report, which will be much more comprehensive this year. We’ve been hard at work analysing the data and identifying emerging trends. As usual, there will be some surprises. We’ve spent extra time eliminating duplicate entries in various MLS systems, so we feel quite confident this new set of numbers will be the Most realistic picture of what is actually happening in SW Florida real estate. We’ll be drilling down much deeper so you can see what’s been happening in various neighborhoods. Stay tuned for official announcement for the release date for this very special report. OK, who knew the video updates would be so popular? This week’s video updates are in, and instead of doing our traditional in office video update, we decided to post some of the news stories we did last week on the local news. This idea started out last year as a fun experiment, and what we’ve discovered is people like it and expect it. This past week we received several e-mails and comments asking where the video updates are. On January 6, 2009 we did an interview on WINK News 6 PM regarding Hank Fishkind’s recently released report and how he expects the SW Florida real estate market to go in the next 3 years. We talked about affordability being back in the Fort Myers real estate market and how northern buyers are here this season and buying due to the low prices. We also did an interview for WINK News at 5 PM and we talked again about Hank Fishkind’s stagnant growth prediction, northern buyers, and making money in real estate on the Buy Vs. the sell. We disagreed with Hank Fishkind’s report to some extent on the SW Florida condo market. You can let us know whether you like the TV News format better, or the simple video update like we did on September 15 in our office. Just leave your comments to this post. We also did news stories on NBC Today Show last September and also NBC NIghtly News with Brian Williams on October 8, 2008. If you’d like to search for your bank owned bargain, or foreclosures in Fort Myers and Cape Coral Florida, visit out Free Search MLS website. November 2008 real estate numbers for Fort Myers and Cape Coral were released recently and single family home sales in Cape Coral and Fort Myers were up 64% over last year, a trend we’ve seen repeated throughout 2008. Median sales prices for Fort Myers and Cape Coral real estate fell 53% from last year, down from $228,100 to $106,100. Statewide home sales were up only 4%, so again SW Florida real estate has been leading the state in home sales. Condo sales in Fort Myers and Cape Coral were down 21% from last year, while statewide they were only down 8%. Statewide sales prices for condo were down 30% and condos in Cape Coral and Fort Myers were only down 20%, perhaps a reason why our sales were down. The better the pricing the more sales we are seeing in any particular market segment.